Copyright 2017 the authors. Licensed under Creative Commons Attribution 4.0 International (CC BY 4.0) https://creativecommons.org/licenses/by/4.0/ This Document is Protected by copyright and was first published by Frontiers. All rights reserved. It is reproduced with permission. Computer games are ubiquitous and can be utilized for serious purposes such as health and education. 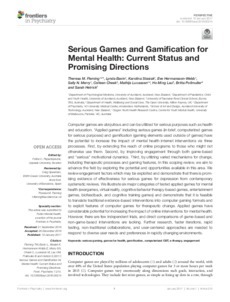 "Applied games" including serious games (in brief, computerized games for serious purposes) and gamification (gaming elements used outside of games) have the potential to increase the impact of mental health internet interventions via three processes. First, by extending the reach of online programs to those who might not otherwise use them. Second, by improving engagement through both game-based and "serious" motivational dynamics. Third, by utilizing varied mechanisms for change, including therapeutic processes and gaming features. In this scoping review, we aim to advance the field by exploring the potential and opportunities available in this area. We review engagement factors which may be exploited and demonstrate that there is promising evidence of effectiveness for serious games for depression from contemporary systematic reviews. We illustrate six major categories of tested applied games for mental health (exergames, virtual reality, cognitive behavior therapy-based games, entertainment games, biofeedback, and cognitive training games) and demonstrate that it is feasible to translate traditional evidence-based interventions into computer gaming formats and to exploit features of computer games for therapeutic change. Applied games have considerable potential for increasing the impact of online interventions for mental health. However, there are few independent trials, and direct comparisons of game-based and non-game-based interventions are lacking. Further research, faster iterations, rapid testing, non-traditional collaborations, and user-centered approaches are needed to respond to diverse user needs and preferences in rapidly changing environments.